Model your Data with LookML. We have a love/hate relationship with SQL. On the one hand, it’s powerful and flexible. On the other hand, it is a write-only language that isn’t reusable or consistent. But SQL is the best way - sometimes the only way - to get the data you need. Until now. 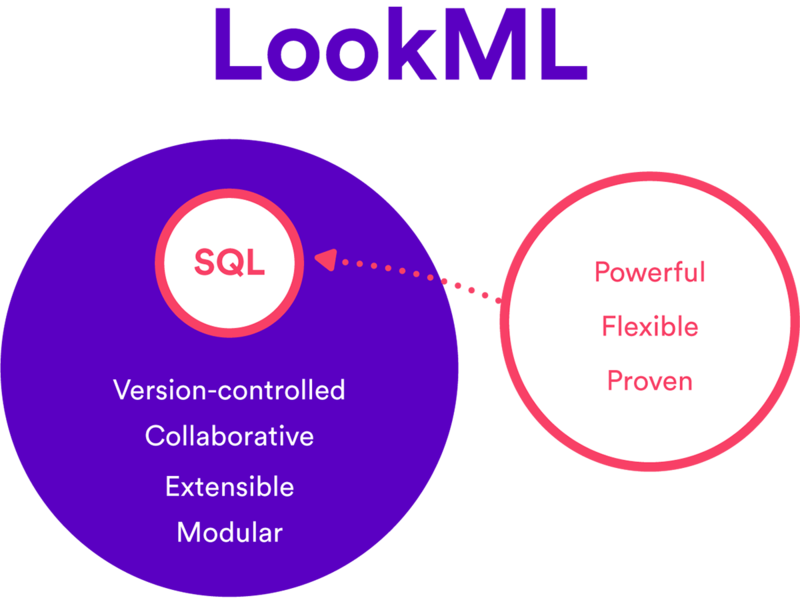 Rather than trying to replace SQL, we built LookML to harnesses all of SQL’s power, while solving some of the toughest things about using SQL in a business. LookML is not a replacement for SQL; it’s the next step in SQL’s evolution. It preserves all the parts you love — power and flexibility — and fixes the parts you hate. By treating SQL like a real programing language, we can abstract away the low-level concerns so analysts can focus on doing great analysis. LookML lets you define your data model once and reference any piece of it anywhere else. Any complex join logic you can specify in SQL can be done in LookML, once, and used by any user. And using LookML means you can trust that your colleagues are using the right SQL, because everyone is referencing the same centralized dimensions and metrics. LookML breaks SQL down into bite-sized chunks that are easy to examine, digest, and recombine. This encourages collaboration and iteration. LookML makes it easier to understand and update snippets, eliminating the need to untangle giant SQL queries all at once. LookML allows you to define your company’s business logic so it can be used by the entire company. But businesses change — you modify the definition of a KPI or adjust your pricing model. When these changes happen, all you need to do is change the definition of that metric in your model once. The metric will update everywhere it is used, and keep everyone on the same page. LookML uses views and models to keep your business logic organized. That means you don’t end up with a folder full of disorganized SQL files. LookML is real code that’s structured and extensible. LookML integrates seamlessly with Git via Github or your own Git server. Each data analyst gets their own dev environment to try out new analyses without affecting everyone else. Every change to your data model can be audited, examined and rolled back, if necessary.